Plot synopsis: In some futuristic mega city, the violence is slowly starting to strangle the lifeblood out of it. 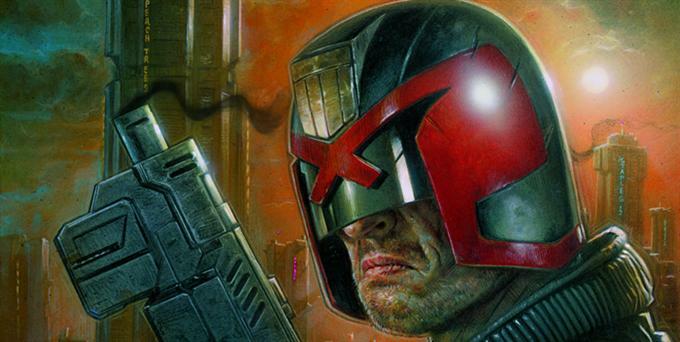 Enter Dredd, a cop with authority to act as judge, jury and executioner. Teaming up with a unproven rookie, he gets trapped in a highrise. The only way out? By dispensing justice - his way. Whenever you get wind of a remake, you immediately harken back to your memories of the original version. Revising it in your mind, so you have a refreshed idea of what to expect when the remake arrives. Anticipation then fuels your expectations, sometimes for better, sometimes for worse. Will it live up to my expectations? Or, will it be something else altogether? This creates a weight, which then (more often than not?) becomes a burden. Happily, this reincarnation of the 1995 version is completely different. In fact, its a hell of an improvement. Gone is the ever so slightly campy tone from the original, in its place, a far more brutal beast. This tone is refreshingly savage, a million more shades of dark. Bleak, blunt, and ultra-violent, this DREDD doesn't pussyfoot around with any pretense of character development. There's not even a scantest hint of romance. Which is great news, it means you can concentrate on the main task at hand. Dispensing justice DREDD style! Karl Urban rocks hard in this remake, he is well suited (In every sense) to the task at hand. He purveys a sense of authority with ease, and most crucially - DOESN'T TAKE HIS HELMET OFF! This small (But extremely important) detail goes a long way to eradicating the sight of 'ol Sly's ugly mug in the first version. Fans of the comic source material should be overjoyed at this prospect. Indeed, by not removing the helmet, DREDD becomes far more mysterious - we can't see his eyes, therefore we can't 'see' what he's thinking at any given time. You don't need to either! His forceful actions speak volumes about where he's at. The other standout is Lena Headey as Ma-Ma, the viscious leader of the drug gang enslaving the occupants of the tower. Ma-Ma is evil personified, absolutely ruthless in her determination to ensure that the building is hers - and hers alone. She will stop at nothing to achieve this, eliminating with extreme prejudice any mortal foolish enough to cross her path. Headey revels in this role, playing Ma-Ma with a steely conviction that is enthralling to watch. Also, if your not aware, she is in the superb HBO series "Game of Thrones" as the scheming Cersei Lanister - definitely an actress to keep an eye on for future roles. The 3D is cool, emphasizing certain scenes - particularly the 'slo-mo' drug scenes - very effectively. Everything else? It all just works in the context of this movie. The pacing, the tone, the direction, the intensity, are just a few parts to highlight. So, you can kinda guess what conclusion I've already come to! DREDD is more than worthy of both your hard earned money - and your precious time. You can't get a better recommendation than this, can you?